When ruffed grouse hunters talk about reduced numbers of birds, they often cite maturing cover, land development or poor nesting conditions. Now there is s new threat to one of the country’s favorite gamebirds: West Nile Virus. "The tendency is to give up. I hear it repeatedly from hunters in Pennsylvania and other states: ‘Nothing we can do now.'" In 2016 the Centers for Disease Control and Prevention reported that WNV antibodies were detected in gamebirds such as chukar and ring-necked pheasants, though the disease is not known to kill those birds. West Nile reportedly has accounted for many sage-grouse fatalities, and some waterfowl and avian predators such as owls, hawks and even bald eagles have tested positive for the disease. In 2015 the Pennsylvania Game Commission (PGC) began studying the impacts of WNV on ruffed grouse populations. An initial laboratory study showed that 40 percent of infected chicks died quickly of the disease, with another 50 percent showing lesions and inflammation in major organs. Fortunately, data from hunter-harvested birds seem to indicate that grouse show higher promise of surviving West Nile when they live in high-quality habitat with ample food supplies. In license years 2015 and ’16, the PGC conducted a program of large-scale grouse-blood collection from successful hunters. In license year 2017 collection on a more targeted and smaller scale was done. The state’s next grouse-blood-collection likely will occur in about five years, to determine if WNV antibody levels in the grouse population have changed. "I’m always careful to say, right now it appears that abundant and high-quality habitat in a prime-forest-community type seems key." She says high-quality habitat helps grouse weather the threat of West Nile, because it keeps birds in good physical condition by offering a variety of year-round food sources that are easily accessible and provides dense cover, so that weakened or sick birds have security while they recover. Biologists in Pennsylvania and elsewhere have not reported any cases of humans or bird dogs contracting West Nile through consumption of ruffed grouse or any other wild game. But the prevalence of West Nile appears to be expanding. ► For current information on West Nile Virus, the Pennsylvania Game Commission website has the most complete and up-to-date research on the disease in ruffed grouse. Hunters interested in other states’ findings should consult those states’ websites. ► If you kill a grouse and suspect that it may have WNV, Pennsylvania biologist Lisa Williams suggests labeling the bird with the date, location, and your name and contact info and freezing it. Then contact your state’s wildlife agency for instructions. This applies to wild turkeys and other gamebirds as well. Any information gathered about West Nile Virus will help biologists form their actions plans. —J.H. Virginia and Kentucky also reported finding grouse with WNV. New York found WNV antibodies in animals in the early 2000s, and passive surveillance continues there. In 2005 Minnesota tested grouse during the Ruffed Grouse Society National Grouse and Woodcock Hunt and found WNV antibodies. Check the game-and-fish websites of other Northeast, New England and Midwest states to find out current info. Hunters can’t stop the disease. We can’t immunize every grouse or eradicate every mosquito carrying WNV. But we can help improve habitat, so that surviving birds, including those carrying West Nile antibodies, can recover and thrive. For now, the best hope comes from focused research and the dedicated efforts of hunters to help improve habitat and therefore preserve grouse populations. Once again, as with many conservation challenges, this is a call to action for hunters to step up. 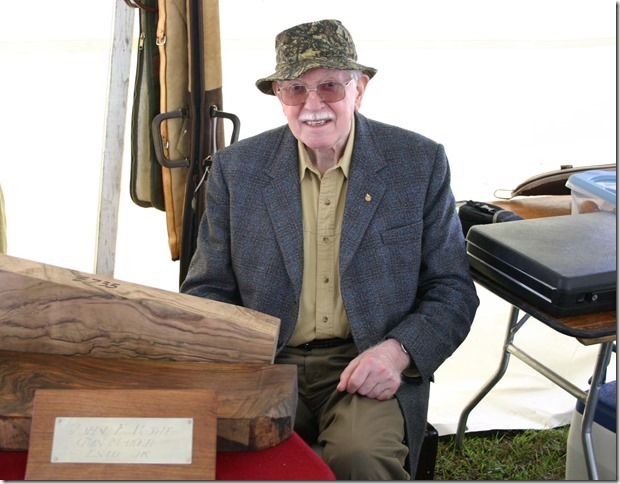 Jack Rowe, the Birmingham-born-and-trained gunmaker who had practiced his trade in the US since 1982, died June 12 at home in Enid, Oklahoma.